Whether it is a hot drinks vending machine or a snack vending machine you require, Apple Vending are able to help. It is our aim to provide you with the standard of catering that will have you coming back for more day-in day-out. As a privately owned company we can be flexible in the way we service and operate your catering/vending service. Vending Machines Yorkshire supplied by Apple Vending. Quality business coffee vending machines, hot drinks vending machines and food vending machines. Apple Vending has a solution for all your vending needs. From office tabletop espresso vending machines through to freestanding hot drinks vending machines. Apple Vending supply cold drinks, coffee vending and food vending machines. Whether you’re searching for a fresh espresso coffee vending machine from bean to mug. Or crisp ground coffee or instant coffee machines, our quality professional vending machine management guarantees you can appreciate our savvy, dependable involvement and years of experience in the vending industry. 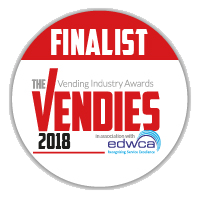 Managing vending machines throughout the Yorkshire area for many years Apple Vending has a wealth of vending machine experience to offer your business. When looking for a simple desktop coffee machine through to well stocked large business vending machines Apple Vending can help you out. Trouble free, our vending machines arrive with prior comprehensive preparation and with managed installation as standard. Inclusive of this, we’re expertly prepared in repairing or overhauling any machine supplied and also being able to supply all of your consumable vending needs. We have staff on the road daily looking after the requirements of our vending machine clients no matter how big or small. Why not contact Apple Vending today for a no obligation discussion about your vending machine needs. We understand how a vending machine can be advantageous and make your business a better environment for you and your staff. A vending machine in your office or workplace can make the work environment a nicer place. If you have fresh coffee or cold drinks available quickly and easily, time can be saved during the working day. Our vending machines can be leased, hired or rented and managed and stocked with your favourite coffee, cold drinks and snacks. From the smallest desktop solution, through to large or multiple vending machines. We can supplu coffee vending, drinks vending and snack vending machines.